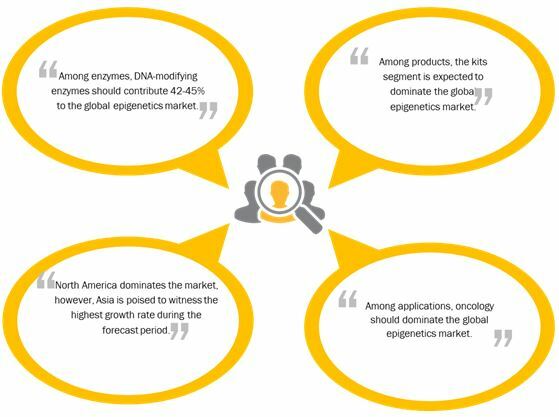 According to a new market research report \“Epigenetics Market by Product (Kit, Enzymes, Reagent, NGS, Mass Spectrometer, PCR, Bioinformatics), Application (Oncology, Cardiology, Immunology), Technology (DNA Methylation, Histone Modification), End User (Academic, CRO) – Global Forecast to 2022\“, published by MarketsandMarkets?, the market is projected to reach USD 1,605.7 million by 2022 from an estimated USD 854.0 million in 2017, at a CAGR of 13.5% during the forecast period. The key factors that are driving the growth of this market include The decreasing sequencing costs and time, increase in research activities to identify and develop inhibitors/drugs for various diseases, funding for epigenetics research, and rising prevalence of cancer. According to a press release published by the Tufts Center for the Study of Drug Development in May 2015, biopharmaceutical companies have nearly doubled their R&D investments in personalized medicine over the last five years, and these investments are further expected to increase by 33% over the next five years. This will further drive the use of epigenetics tools. A 2016 study performed to analyze the epigenetic modification of chronic lymphocytic leukemia (CLL) in the patient population fueled interest in prognostic biomarkers and personalized therapies. This study was performed by CeMM Research Center for Molecular Medicine of the Austrian Academy of Science (Austria) in collaboration with the University of Southampton and the Royal Bournemouth Hospital under the European BLUEPRINT project and the International Human Epigenome Consortium. The expanding application of epigenetics in personalized medicine and targeted therapies, therefore, offers significant opportunities for market growth. Based on application, the oncology segment accounted for the largest share of the Epigenetics Market in 2016. The large share of this segment can be attributed to the rising prevalence of cancer and the increasing number of research-related activities. On the basis of technology, the Epigenetics Market is segmented into DNA methylation, histone modifications, and other technologies (includes non-coding RNA and chromatin remodeling). The DNA methylation segment accounted for the largest share of the Global Epigenetics Market in 2016. The large share of this segment is attributed to the increasing incidence of cancer and the ability of this technique to study different types of cancer with quality outcomes. North America accounted for the largest share of the Epigenetics Market in 2016, followed by Europe. Increase in epigenetics research activities, favorable government funding initiatives, high R&D expenditure, rising incidence of various diseases, and the presence of key players in the region are the key factors driving the growth of the Epigenetics Market in North America. The major players in the Global Epigenetics Market are Illumina (US), Thermo Fisher (US), Diagenode (Belgium), QIAGEN (US), Merck Millipore (US), Abcam (UK), Active Motif (US), New England Biolabs (US), Agilent (US), Zymo Research (US), PerkinElmer (US), and Bio-Rad (US).